and massive upper body strength? Director Kenneth Branagh brings THOR to the big screen with all the respect that a Thunder God deserves and all the cut obliques that a woman craves. And having Mr. Branagh at the helm explains the preponderance of British accents. Banished to Earth for his arrogance, the Norse god of bad weather, Thor, must learn humility and sacrifice before he can return to Asgard, the realm of the gods. It’s a simple enough redemption tale, coupled with some fish-out-of-water gags, but what sets this Marvel Studios production apart from lesser superhero tales like CAPTAIN AMERICA or FANTASTIC FOUR is the depth of story and the talent of the actors conveying it. ‘Whaaaat?’ say you, who were pushed back in your seats from the bone-rattling action and eye-dazzling visualization of the realm of the gods; wasn’t this just another bombastic bombast of bombalicious bomba? 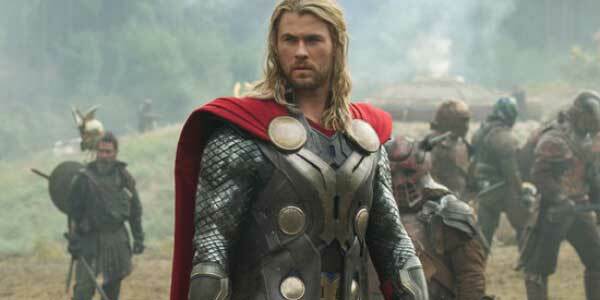 What set THOR apart from mere mortal movies? It’s majestic, tragic, epic and colorfully kinetic; and yes, its dazzling action is indisputably modern and geared toward popcorn, but the overarching story of heavenly political intrigue is decidedly Shakespearean (now that Kenneth Branagh connection makes perfect sense): two sons of an aged king want the throne, one to expand the kingdom forcefully, one to betray the kingdom and win it back duplicitously. Both bad reasons, yet pitting each against the other and both against their father. Now I’m not giving the writers any undue credit, all these elements are written into Norse legend and Marvel canon; I’m saying that they brought these elements to the screen very successfully. Anthony Hopkins is Odin, ruler of Asgard (the only mortal who can realistically play a god – besides Morgan Freeman), all-powerful, all-wise, all-beard, who regretfully banishes his impulsive son Thor for inciting war with the frost giants of Jotunheim. Blond and body-beautiful Chris Hemsworth is Thor, haughty regal manner and heavenly abs, such a likeable guy, even when he’s being arrogantly medieval. Reminds us of Brad Pitt with bigger biceps. (If THOR were made ten years earlier, with this technology, the role would have gone to Pitt.) We see the unmatched power of Thor as he battles hundreds of frost giants, led by King Laufey (Colm Feore). While his warrior friends ineffectually swordfight like fey minstrels, Thor commands the thunder do his bidding, he cracks the very ground, he flies, he wields the mighty hammer Mjolnir like a spinning turbine, and destroys in one fell stroke a gigantic monster that looks like a Rancor. I especially like the “spots” on Thor’s costume – the filmmakers haven’t scrimped on the design or modernized it, giving him medieval arm gauntlets and a big red cloak to go with his big upper body strength. When Odin banishes Thor, he also wrests from him Mjolnir, and flings it Earthward with the imprecation that only “he who is worthy of the power of Thor” shall be able to lift it. As a final insult – he pulls off Thor’s spots! Not the spots! On Earth (known as Midgard to the gods), Thor falls in with three scientists, Jane Foster (Natalie Portman, disgustingly slim and pretty), Erik Selvig (Stellan Skarsgård, who in real life, is actually from the Norse lands where these gods originated!) and Darcy (Kat Dennings, who has that annoying yet adorable girly habit of wearing her sleeves down past her palms). Jane tells Thor of her studies of Einstein-Rosen bridges (wormholes), which explains scientifically the beautifully visualized “rainbow bridge” from Asgard. And Thor tells Jane of his lost hammer, which is really a metaphor for how he’s feeling after being divested of godly powers. It doesn’t matter to Jane; she just wants to play patticake with his unspotted torso. THOR is filled with subtle details that are given no fanfare, yet set it apart from the average movie: when Thor is told the hammer is “fifty miles west of here” he walks out into the street boldly – and is honked at by cars, making us realize ‘That’s right – he knows no road rules!’ – then he looks up at the sun to gauge direction. Loki sends a fire-breathing robot to Earth to “kill them all” (when it lands in a great thoom on the desert floor, a SHIELD agent asks, “Is that one of Stark’s?” – a sly, sideways reference to IRON MAN). Only when Thor proves his humility, courage and self-sacrifice against this robot does Mjolnir become his plaything once more. And he gets his spots back! There are no cackling villains, no overacting, no rubbing-hands-in-glee schemes; everyone is controlled and sedate, as befitting a realm of gods. Especial credit to Colm Feore as Laufey, whose devilish makeup simply screamed rubbing-hands-in-glee, but comported himself like a true killer of gods. There’s Rene Russo looking old and queenly as Odin’s wife; Idris Elba is Heimdall the Gatekeeper, who manages to be All-Seeing except when danger is imminent; Jaimie Alexander is Sif, the hottest of Thor’s bosom buddies (emphasis on bosom). Movie ends with a promise, “Thor will return in THE AVENGERS” – an ambitious, all-encompassing endeavor by Marvel Studios to bring many superheroes together in one movie. Unlike the superhero universe where heroes band together to fight evils that are greater than any single one of them can handle, we’re entering the corporate universe of copyrights and licensing and avariciousness – True Evil. I wonder who is overseeing it all. What a task it must be to coordinate all the strands of franchises and directors and canon; it’s hard enough organizing five band guys to get to one studio on time and have all their parts learned; imagine what organizing this Marvel Multiverse must be! For Marvel to pull it off, they have become as powerful as the new gods they have been promulgating over the last fifty years. The minds at Marvel Corp are the new superheroes. And it has nothing to do with their upper body strength. aka: THE MIGHTY THOR, THOR: THE GOD OF THUNDER. Writers: Stan Lee, Larry Lieber, Jack Kirby, Ashley Miller, Zack Stentz, Don Payne, J. Michael Straczynski, Mark Protosevich. Starring: Chris Hemsworth, Natalie Portman, Anthony Hopkins, Stellan Skarsgård, Kat Dennings, Tom Hiddleston, Clark Gregg, Colm Feore, Ray Stevenson, Idris Elba, Jaimie Alexander, Rene Russo. Gods of Creation and creation of gods. All Superman media is credited, “Created by Jerry Siegel and Joe Shuster.” That’s only because cartoonist Neal Adams fought claws and cape to get that credit after Siegel and Shuster ingenuously signed away their rights. We rarely see credits for other superheroes’ creators due to this same simple political treachery – no one wants to relinquish any monies to actual creators who don’t have the foresight to enter into worldwide, far-reaching contracts in their twenties. The icon was born from creativity, and continues due to avaricious legality. In the case of THOR, Marvel Corp reminds me of Walt Disney Corp – how Disney took Grimm’s SNOW WHITE and Collodi’s PINNOCHIO and Aberson’s DUMBO and simply called them their own. Who remembers the real authors of these tales, whose names get progressively buried under the passage of time? 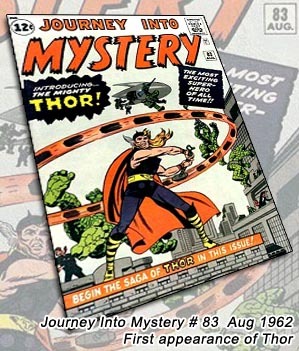 So too, Thor’s creators, Stan Lee, Larry Lieber and Jack Kirby, ransacked Norse legends to “create” the iconic thunder god – and now he’s a Marvel property! On top of that, even these mortal creators are not credited with Thor’s creation in the credits – now he’s a Marvel Studios property! Not very respectful to the god who gave us Thursday.